Our volunteers and contributors have played an integral part in the success of our program. There are many ways to support our mission. Whether it is through attendance at one of our events, a monetary donation, or volunteering your time, all are crucial in providing the highest level of care for our residents. We will be releasing information about our 2018 event shortly. We would be glad to put together a package unique to your business! Thanks to our Sponsors for supporting our mission at our Homecoming Project Gala 2017. 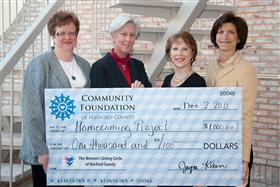 Thank you to the Women’s Giving Circle of Harford County! The grant we received allowed us to provide our women with two computer workstations. Donations come in many forms. If you wish to make a monetary donation please send a check to Homecoming Project, Inc. PO Box 1190, Bel Air, MD 21014. Donations to our scholarship fund, which is used to help residents with purchasing uniforms and necessary clothing items such as socks and undergarments, are greatly appreciated. We prefer not to accept clothing donations as many times these donations do not fit our resident’s needs. We are willing to accept some appliances and housewares for upcoming program graduates and alumni. Please feel free to contact us if you are unsure if a donation fits our needs. We also accept gift cards to places such as Target, Wal-mart and local supermarkets so we are able to purchase items such as paper products, cleaning supplies & food. Our volunteers have played such an important role in the lives of our residents. Local volunteers have provided our residents with a variety of fun and therapeutic leisure activities, including yoga, water aerobics, piano lessons, and arts & crafts. We are also in need of volunteers for our weekly education session. Volunteers have presented on a variety of topics such as domestic violence, biology of addiction, and career exploration. If you are interested, please visit our volunteer page and submit the online application.